It is known as Al-Muallaka (the hanging) because it was built on the ruins of two old towers that remained from an old fortress called the Fortress of Babylon. It was dedicated to The Virgin Mary and St. Dimiana. The Hanging Church is considered the oldest church in the area of Al-Fustat (Old Cairo). It dates back to the end of the 3rd Century A.D and the beginning of the 4th Century A.D, but it has been reconstructed and renovated several times since. 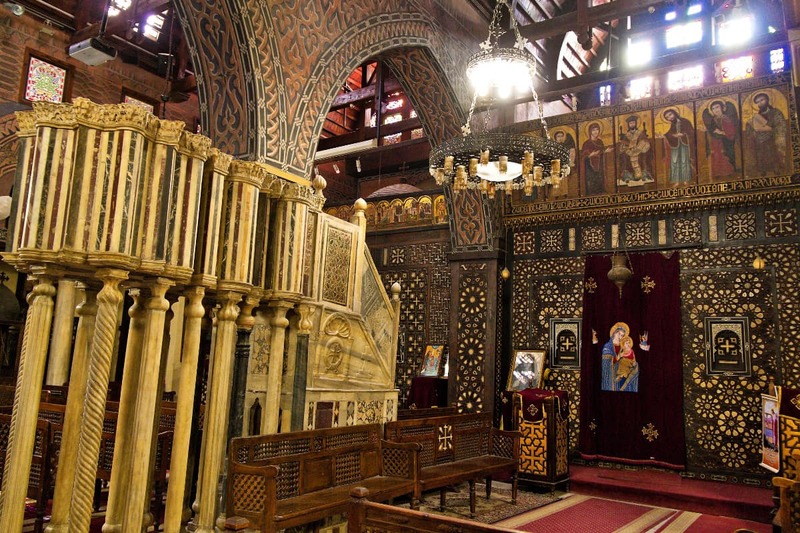 Some historians believe that it was built earlier, and it might have been a Roman Temple that was later converted to a Roman Church, and at a later date still, it became a Coptic Church. This was proved by the discovery, in 1984, of the scenes, on the western side of the right aisle of the church, which contained pagan Roman Gods, but layers of plaster had covered them. 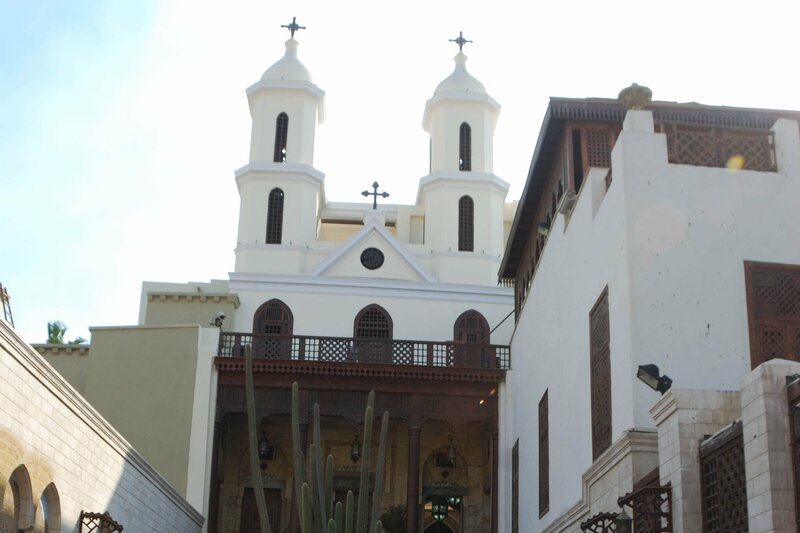 This church has played an important role in the history of the Coptic Church because it became the seat of the Patriarchs after transferring it from Alexandria to Al-Fustat. The 66th patriarch Anba Christodolos (1039-1079 A.D) was the first Pope to chant the Holy Liturgy in the church. This was maintained in El-Mullaka Church until the 14th Century, when it was transferred to Abu Sefein church. There are 110 icons here, the oldest of which dates back to the 8th Century, but most of them date to the 18th Century. Nakhla Al- Baraty Bey gave some of them as gifts, in 1898 A.D, when he was the overseer of the church. The French monk Vansleb, who was sent to Egypt in 1671 by King Louis XIV in order to study the state of the churches and the monasteries of Egypt, mentioned that he had seen on one of the walls of the Hanging Church, inscriptions written by the hand of the great Muslim commander Amr Ibn El-As, asking the Muslim people to treat this church with respect. It takes the shape of a basilica and it has a wooden roof in the shape of Noah’s Ark. The church was once very spacious but it became much smaller, throughout the ages, after several modifications. Obeid Bin Khozam did the last modification in 1755 A.D. It now measures 23.5m in length, 18.5in width and 9.5m in height. Entrance known as The narthex. The nave and the two aisles. Some steps lead to the middle entrance. On both sides of this entrance there is a door that leads to 2 upper floors, dedicated to the dwelling of the priest. In front of the entrance there is a vestibule that was used as a resting place for visitors. Inside, the southern aisle is separated from the nave by 8 marble columns, linked from above with a wooden architrave, which is supported on arches. The northern aisle is also separated from the nave by 8 marble columns but there is no architrave. Nearly in the middle of the southern aisle there is a door, which leads to a small church with a sanctuary. Inside this small church there is a baptistery, which is a deep basin of reddish granite, which probably dates back to the 5th Century. It is decorated for the sign of water in Hieroglyphics. Of the three sanctuaries situated on the eastern side, the most important is the middle one, which is dedicated to the Virgin Mary. In the centre of this main sanctuary there is an altar made of marble. Above it there is a wooden dome, supported by 4 marble columns, and decorated with religious scenes, such as Jesus on his throne surrounded by the four evangelist saints, the disciples, and angels. In front of the middle altar, in the nave of the church, is a pulpit that stands on 15 columns, decorated with relief and mosaics, symbolically representing Jesus, the 12 Disciples, John the Baptist and the Virgin Mary. There are 7 altars in the Church, 3 of them situated in the main sanctuary, and 3 located in the right sanctuary, among which is the altar of Tecla Hymanot, the Ethiopian Saint, and another that was recently discovered in the northern side.